Once upon a time ... this is how the story begins of our quest to discover the old villages, medieval towers and castles that form part of a landscape from the distant past, taking the breath away of exploring travellers. We are visiting the most secret corners of Emilia Romagna, a strip of land bordered to the west by Liguria, to the north by Lombardy, to the west by the Veneto region and to the south by Tuscany. This region is renowned for its culinary delights, its wine and food tradition and for being the heart of the Italy’s Motor Valley, the homeland of some of the most famous luxury sports cars in the world. 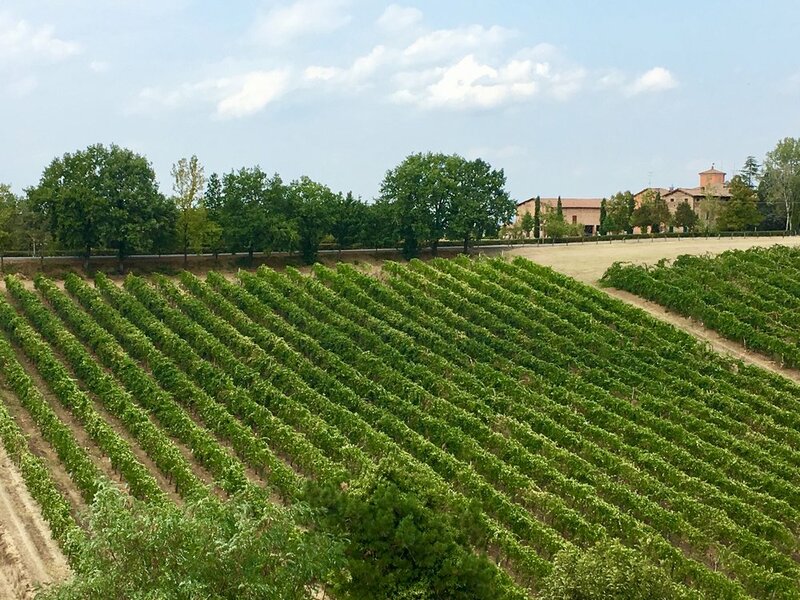 Our itinerary will lead you on a discovery of the land of Lambrusco and the traditional balsamic vinegar of Modena, a region that can be enjoyed to the fullest through Castelvetro di Modena and Levizzano Rangone, places so beautiful they seem to come straight out of a children’s storybook. Castelvetro di Modena from a distance. 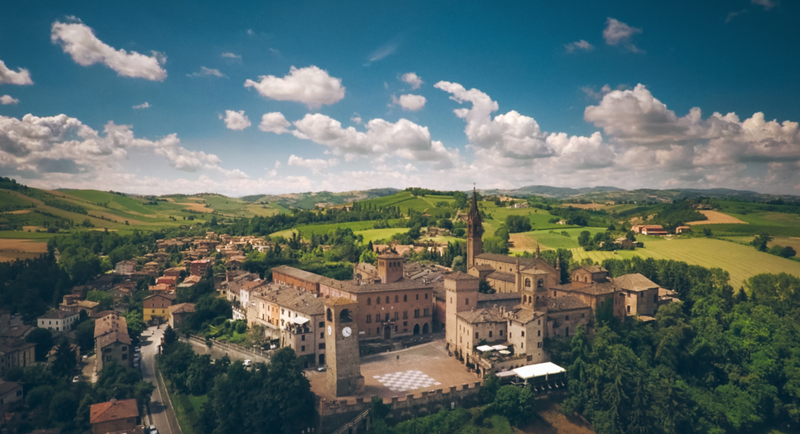 Our journey begins at the historical village of Castelvetro di Modena, its skyline lined with picturesque towers and bell towers standing out against the fertile surrounding hills, welcoming those who arrive from a distance. This small town is a veritable treasure chest offering the gems of its cultural heritage, such as the remains of the fortress walls and the Oratorio di S. Antonio di Padova, built on commission in the 17th century for the Rangoni family, the noble dynasty of the area. Here we enter the historic center, where we are welcomed by the Torre delle Prigioni, built in the second half of the 16th century, standing more than 20 meters tall. A little further on we come onto Piazza Roma, the beating heart of the town, offering panoramic views over rolling hills. However, our attention is caught by the black and white paving forming a highly original chess board in the square; this special feature has led to Piazza Roma being attributed the alternative name of “Piazza della Dama” (Chequers Square), which every two years becomes the stage for a live chess game with human figures. The Old Town of Castelvetro with its large chessboard. Photo Credit: Francesco Ferrarini. The town of Castelvetro continues with its attractions, where visitors can admire Palazzo Comunale, Palazzo Rinaldi, and the enchanting clock tower Torre dell'Orologio that dominates the square and is undoubtedly one of the outstanding symbols of the town. The Tower was built between the 11th and 12th century and represents what remains of the ancient fortification on the eastern side of the castle; in the 12th-13th century it was probably equipped with a bell used to summon the local people to the square, while a sundial, clearly visible from the southern side, still shows the passing of time today. Here we leave the square and head towards the imposing church with its Neo-Gothic architecture, built in 1897. Three doors open from the façade, topped by roses and hanging arches, while the interior features three naves with columns, an altar in Carrara marble and various paintings, originating from other churches and oratories of the area. The church facade visible from a distance. The sleek bell tower stretches to the sky, standing 48.5 meters high, and is certainly one of the most beautiful towers in the province of Modena. Opposite the church we find the impressive Palazzo Rangoni, famous for having hosted the Italian poet Torquato Tasso. The building opens onto a large entrance with decorated atrium, an internal courtyard, leading to the grand staircase and a landing that links the two wings of the building. Walking along the little lanes of this small village in the heart of the hilly Modena countryside, we discover small workshops from the past and places for refreshment, especially the classic trattorias full of rural character, where everything is made just like it was in the past, by the expert hands of the “razdore” (ladies of the house). Homemade stuffed pasta, dressed with an excellent, delectable cream made with traditional Modena balsamic vinegar and Parmigiano Reggiano, accompanied by a Lambrusco Grasparossa di Castelvetro, the sparkling wine par excellence that achieves its utmost expression in this region. 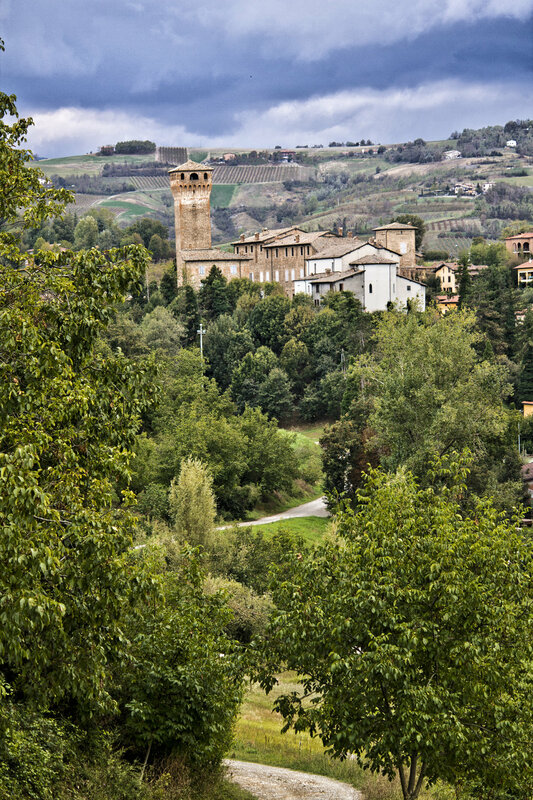 We then set out on a discovery of Levizzano Rangone, another small village nestled between vineyard-covered hills. On our arrival, we are welcomed by the wondrous Castle, where we stop to admire the architecture and its formidable twelfth-century walls. In fact the historic center is made up of a handful of houses dating back centuries, now lovingly and skilfully restored. These homes tell the tales of the country folk who once lived simple lives here according to rural traditions, which still echo around the thick walls of the brick houses in the area. Lambrusco Vineyard from the castle of Levizzano. Next to the castle stands the Torre Matildica, soaring upward to the sky; together, this tower and the castle are the symbols of Levizzano Rangone. 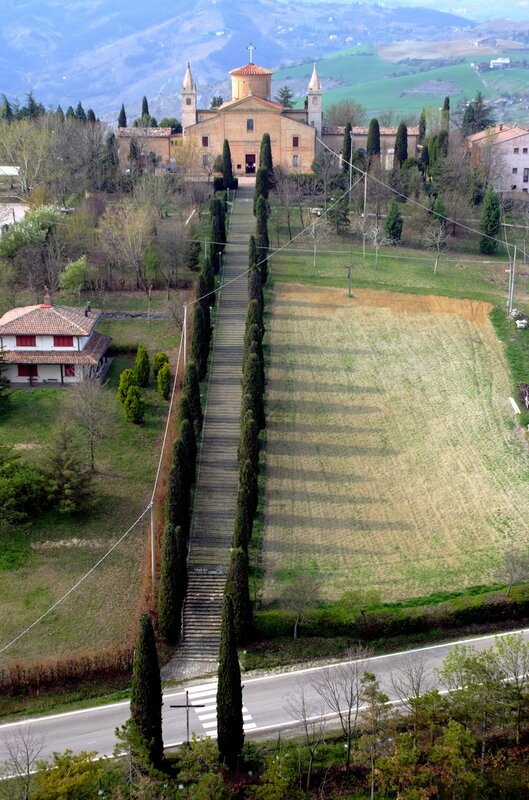 The castle was built as as defensive bulwark against the Hungarians and later granted to the Marchese Bonifacio of Tuscany, father of the famous Matilda of Canossa. The most recent major restoration work on the castle dates to 2007, a project that restored the building to its historical and cultural magnificence, turning it into an ideal venue for exhibitions and cultural activities. On entry to the castle, visitors can admire the “Stanze dei Vescovi” dating back to the 16th century, with ceilings adorned in rare and impressive fresco paintings. The other rooms of the castle feature family coats of arms, decorating the traditional coffered ceilings, together with allegorical figures and friezes. The upper fascia of the walls is decorated with frames enclosing frescoed scenes of the era with horsemen, hunting figures, and landscapes with small villages and castles of surrounding areas. Outside the castle, our attention is captured by an ancient Napoleonic cemetery, named Campo San Rocco, built in the early 1800s according to Napoleonic law that dictated the location of cemeteries outside the Castle walls. At the center stands a small chapel, but this site no longer serves as a cemetery and is now used as an atmospheric setting for concerts and other events. Our visit continues to the cathedral in the small village of Levizzano, built in the Neo-Romanesque style in 1903. Inside the layout is based on three naves, where typical elements return in the Romanesque style, such as the full round arches and groin vaults. In the side chapel of the right nave we find a painting dating back to the mid-18th century, depicting a kneeling St. Anthony the Martyr. Nearby an angel holds a book and a sword; another angel can be seen on the clouds, crowning the Saint with roses; in the background we can see a light grey drape, and further away the castle of Levizzano. After admiring the beauties of this little town, we head back to the road that leads from the center of Levizzano to Puianello, another place just a few miles away, its road made up of hairpin bends and breathtaking views. To the left and right are gullies and ravines, an erosive geomorphological phenomenon caused by water on clay-rich soil, which sculpted and shaped the land over time, turning it into a landscape that seems even lunar in some sections. After traveling a few miles on the provincial road, we come to the sanctuary of the Beata Vergine della Salute, which stands on the Puianello Hill in the municipality of Castelvetro, at an altitude of 475 metres above sea level. A terrace on the Po Valley opens up before us, offering a panorama that continues up to the Alps. The sanctuary was built in the 17th century by the count Ugo Rangoni as thanks for salvation from the plague. At the time, the sanctuary was dedicated to the Madonna della Salute. Over the years, the small oratory fell to ruin and, in 1716, the countess Teresa Rangoni began construction of the current sanctuary, which was completed in 1721, five years after the first stone was laid. Today, this place continues to fascinate us by virtue of its privileged position and panoramic road, which can fill even the inattentive traveller with emotion.